*Drawing Everyday*: Greetings from Hummingbird Heaven! 5.5 x 7.5" - transparent watercolor on yupo paper, matted to 8 x 10"
and did this 20 minute challenge painting in watercolor. I love doing these quick yupo paintings! There's no time to get tight! 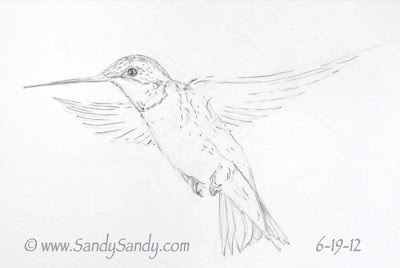 Here is yesterday's pencil sketch. FYI - I've just posted the first two hydrangea paintings from my personal contour drawing challenge on my web log. I love the suggested flowers behind the hummer!!! And how I envy how many hummingbirds you have on a daily basis. We are lucky to have 1/2 a dozen and then not at the same time because of their territorial battles. Rarely can more than one sit at the same feeder. Must be where you live to have all those beauties visit you each year!!! Thanks Susan. I love the 20 minute challenges because it makes me work fast and loose. No second guessing, Just running on instinct and NO fiddling. Don't give up . . . It takes a lot of years and dedication to their needs - to build a flock this size, Susan! Thanks for the inspiration, Teri! Thanks for your thoughts, JoAnn! I hope you will come out and see them in person this summer! Wow, you have a real knack with that Yuppo paper. It's fun, but slippery, stuff! The background is absolutely wonderful! Many thanks Nora! 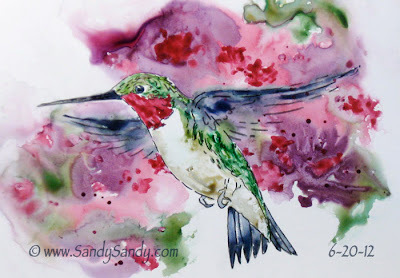 I really appreciate your compliments, especially since you are the queen of bold and loose watercolor! Good to hear from you, Minnnemie! THANKS!